The early part of the twentieth century witnessed a growing cultural self-awareness in many places. The Harlem Renaissance explored black culture and radiated around urban America from its base in New York; the Jindyworobak Movement in Australia celebrated indigenous art forms, and this protest against cultural imperialism was reflected in other countries within the British Empire, where language and local culture had been Anglicised. Charles Rennie Mackintosh’s Glasgow School of Art and James Herbert McNair’s paintings and furniture design had an gained international reputation. Mackintosh and McNair were both part of the Arts and Crafts movement which moved away from mass production and sought to promote individual creativity. Scotland was set to take deep breaths of confidence in the wake of this home-grown success. 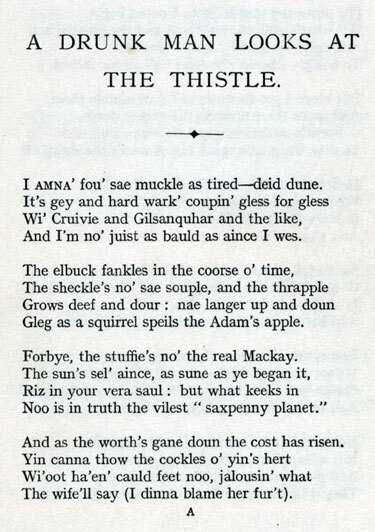 Until the end of the nineteenth century Scottish life in fiction and poetry was depicted in what was later regarded as coarse writing, representing a rough Scottish life with all its blemishes. As a reaction against this, an overly sentimental representation of rural life had become popular (known as the Kailyard School of Scottish fiction) and had held sway until the 1920s. By 1925 MacDiarmid had started to write in a kind of “synthetic Scots” known as Lallans, a mixture of regional Scots dialects appended to a Standard English grammatical structure. This clarion call had been taken up by others, and soon a group of writers shared the same aims: Neil M. Gunn, Lewis Grassic Gibbon and Sorley MacLean, among others. There was a self-confidence in the air and a pride in all things Scottish, which also permeated architecture and art. After the Second World War, the movement’s fervour evaporated slowly, although many of the participants lived on until much later. By the 1960s the Scottish Renaissance could no longer be regarded as revolutionary, and it was eclipsed by other literary movements. It formed a basis however for the Scottish Independence Movement. HUGH MACDIARMID (1892-1978) was born in Langholm, Dumfriesshire, the son of a postman. Due to his mother’s employment he had access to unlimited books from the Langhorn Collection and by the time he left home had read most of them. He also received encouragement both from his teacher and the minister of the local church. After obtaining a degree from the University of Edinburgh, he served in World War One and became a journalist in Montrose, Angus. His writing career began in the 1920s, and invariably he was controversial, mixing the literary and vernacular. MacDiarmid galvanised the Scottish Renaissance movement. A Drunk Man Looks at the Thistle (1926) is the most ambitious expression of his critical nationalism and fervent internationalism. His later philosophical poetry (in English) is epic in scope and employs an amalgam of found poetry technique (reusing text from a variety of sources), and illustrates well his vigorous intellect and engagement with science. As a man of action, he helped found the National Party of Scotland (and stood for Parliament in 1950), but confusingly he was also a member of the Communist Party: he must be one of the very few who was expelled from both for being a member of the other (he rejoined both), and was on George Orwell’s British Intelligence list as a communist sympathizer. His Who’s Who entry shows one of his hobbies to be “Anglophobia.” MacDiarmid is recognised as the towering Scottish literary figure of the twentieth century. LEWIS GRASSIC GIBBON (1901-1935) was born James Leslie Mitchell in Aberdeenshire, and spent most of his early life in a crofting community. He left school early after arguing with the school authorities, and spent time as a journalist in both Aberdeen and Glasgow. His time in the slums of Glasgow reinforced his left wing beliefs and he helped to form the Aberdeen Soviet. After dismissal from The Scottish Farmer newspaper for disagreements over expense claims (which he was claiming and donating to the British Socialist Party) he joined the army, travelled widely, and during this time produced his first short stories. In 1928, determined to devote his life to writing, he settled in Welwyn Garden City. Few newspaper or magazine publishers would take his work, though H.G. Wells acclaimed one of his first published short stories. His crowning glory was the trilogy Scottish Quair (Quair merely means Book), consisting of Sunset Song (1932), Cloud House (1933) and Grey Granite (1934). Following the life of its heroine Chris Guthrie, the novels’ engaging storyline takes the reader from the Great War to the growing communism of the 1920s, and are written in the language of the ordinary Scottish person, blending Scots and English. Although he died at the early age of thirty-four from peritonitis, Gibbon’s output over his last six years was virtuosic, amounting to seventeen full length books, including novels, short stories, biography and history. SORLEY MACLEAN (1911-1996) was born on the island of Raasay, which lies east of Skye. MacLean’s upbringing was rooted in Gaelic culture and its traditional songs. He obtained a first class degree in English at Edinburgh University, after which he took up teaching in the Isles. Here he was instrumental in preserving and promoting the teaching of Gaelic in Scottish schools. Despite the influence of Ezra Pound and Hugh MacDiarmid, he adopted Gaelic as his working language, and translated much of his own work into English. He fought in North Africa during World War Two, and his intense left-wing feelings, shaped by his wartime experience and the political events that shook Europe in the 1930s – the Spanish Civil War and the rise of Fascism – werel used in his poems: his poetry speaks of love, suffering and injustice. His total output is relatively small but is exquisitely crafted, and in many ways he brought Scottish Gaelic poetry into the modern era. In the 1970s some of his work was published bilingually and he appeared at the Cambridge Poetry Festival. He was already a cult figure in Ireland, thanks to support from the likes of Seamus Heaney. Honoured with many major awards, including the Queen’s Medal for Poetry, Sorley Maclean was surely the greatest Gaelic poet of the twentieth century. NEIL M. GUNN (1891-1973) wrote novels in English rather than Scots or Gaelic, and although in his later years he became preoccupied with the broad political issues of the day (like MacDiarmid, he was committed to both Scottish nationalism and socialism), their setting remained loyal to the Highland communities and landscapes of his Caithness youth; similarly his preoccupation with the sea came from memories of his father’s seafaring life, and his steadfast and earthy female characters were modelled on his mother. As novelist, critic and playwright he was prolific, and his influence on other writers was second only perhaps to Gibbon’s. Published by the Porpoise Press (whose mission was to promote a Scottish publishing industry), it was not until 1937 and after the success of Highland River that he was bold enough to leave his job with Customs and Excise for full-time writing. EDWIN MUIR (1887-1959) was born in the remote Orkney Islands. His early years were psychologically disturbing and led later to his undergoing Jungian analysis: his family were forced by economic need to move to Glasgow when he was fourteen (which he related to an encounter with the “fallen” world), and his father, mother and two brothers died in quick succession; he could find only disagreeable employment. Following a peripatetic existence in Europe, he began to publish poetry in his late twenties; seven volumes were produced in his lifetime. Deeply felt, Muir’s poetry remained for many years little known, but his poetic vision, using plain and spare language, is now held to be of significance. He opposed the Lallans movement of MacDiarmid and had little sympathy for nationalism. He believed that writing in English was the only secure way to create a national literature. He found equal fame as a translator (with his wife, of contemporary German literature such as Kafka) and as an academic. OTHER WRITERS involved with, and inspired by, the Scottish Renaissance movement at various times included Catherine Carswell, Archie Lamont, Eric Linklater, Norman MacCaig, F. Marion McNeill, Naomi Mitchison and Edwin Morgan. 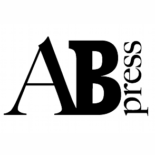 This entry was posted on 23rd February 2015 by admin in books, literature, Scottish Renaissance and tagged books, literature, Scottish Renaissance.